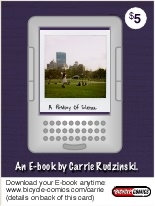 If you bought a download card from Carrie Rudzinski, then you're in the right place! The codes on the back of the download card allow you to download PDF files for Adobe Acrobat and .mobi files for Amazon Kindle. You can use your codes anywhere you have a decent Internet connection (please come back later if you're on the subway). Gotcha! I want the PDF file. Great! I want the Kindle file. Just about any gadget made in the past five years can read PDFs with no problems. Ready to claim your E-book? Okay, I've clicked the button. Now what? Enter the red code on the back of your download card. Presto! Price = $0. Enter your E-mail address. Count to 10, then check your E-mail for the link. We promise not to sell or give your info to anyone. Spam is gross! We'd love to send you occasional updates, but only if you opt in. Click the link to download the file, "a_history_of_silence.pdf"
If your phone/tablet/computer doesn't have Acrobat Reader, you can download it for free from Adobe. You can download Carrie's E-book as a .mobi file and copy it onto your Kindle or onto your smartphone running the free Kindle app. Enter the blue code on the back of your download card. Presto! Price = $0. Click the link to download the file, "a_history_of_silence.mobi"
If you've been doing this from your smartphone or tablet, you should be all set. Open your Kindle app and start reading. If you've been doing this from your computer and you want to move the file to your Kindle, then connect your Kindle to your computer with the USB cable that came with it. Turn on/wake up your Kindle, count to 10, and then drag the file over to your Kindle's icon. Eject your Kindle from your computer and start reading. Thank you for supporting Carrie while she's on tour! If anything weird happens with the download, please E-mail us at customer.service@bicycle-comics.com , and a real human will respond to you by the next day.